The Omsk-born sportswoman, whom admirers from around the world called 'white bear', fell from a top floor flat in an apartment block in Tyumen. 'She was always like a ray of sunshine - so bright was the color of her hair, and so welcoming and smiley', said a statement from the Russian Judo Federation. 'She was kind, strong, big, talented, successful, and she had so many awards. 'Lena Ivaschenko was a leader of Russian heavy weight judo team - and on this day in June she tragically died. Anyone who even briefly spoke to her received a share of her energy and felt immediate sympathy towards her. 'Just as her victories will forever stay in the history, Lena will be always remembered any everyone and anyone who knew her'. Elena Ivaschenko competed in London at the 2012 Summer Olympics in the +78 kg event and lost in the repechage to Iryna Kindzerska. She won a silver medal (2008) and two bronze medals (2007, 2011) at the World Judo Championships. 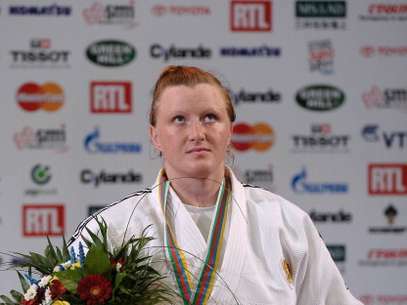 She won four gold medals (2007, 2009, 2011, 2012) and one bronze medal (2006) at the European Judo Championships.